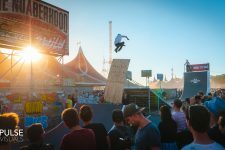 Sven Boekhorst providing professional skate shows and events! Mind the Gap is an innovative formula for competitions and shows for Inline Skating and BMX, performed on a specially prepared mobile skatepark, which main element is a big ramp with a gap inside. 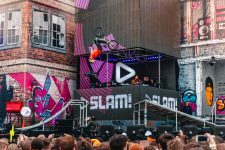 The compact size of the skatepark gives the opportunity to carry out a competition or show at the most spectacular locations in each city, weheras the big gap provides the opportinuty to put special objects between the gap. The compact size provides the opportunity to place the SB Halfpipe on the most spectacular locations. During the demo, the skaters show all the possibilities on skates, explained by the SB host. After an impressive show, the SB skaters will do some interactive stunts with the audience, to get them more involved with the show. Sven Boekhorst is teaching the world how to skate for many years. Also want to learn how to skate like Sven Boekhorst? SB Events provides inline skating workshops for skaters at any level of experience. Whether you want to learn how to skate through the park or want to learn how to do the most impressive tricks. Sven Boekhorst will help you to reach your goal!